Carlson Bridge Technologies, Inc. Private Enterprise, Hawaiia, USA. Designer chemicals known as medicine drugs are greatly ineffective, impotent in preventing or treating disease in this day and age. We have now about 17,000 plus “diseases” defined by the medical profession as opposed to 104 maladies identified at the time of Buddha, about 2,500 years ago. What’s happened on the way to Global Transformation? Have we lost all common sense, logic and intuition in our world? Are we so addicted to the “drug man” that we cannot break free? Designer chemicals known as medicine-drugs-are greatly ineffective, impotent in preventing or treating disease in this day and age. We have now about 17,000 plus “diseases” defined by the medical profession as opposed to 104 maladies identified at the time of Buddha, about 2,500 years ago. What’s happened on the way to Global Transformation? Have we lost all common sense, logic and intuition in our world? Are we so addicted to the “drug man” that we cannot break free? The founding of the first dental school in the world was in 1840 at Baltimore, Maryland-Baltimore College of Dental Surgery. This formalization of educational training was the necessary next important step in the evolvement of the dental surgeon , the specialist of the orthopaedic surgeons, the “medical men” known of in those early years of American history. Most all practitioners of the art and science of dental surgery at that time were well trained in medicine first holding a MD degree or the equivalent. Until 1840 and the institution of the first dental school for dental surgery, there were two modes of training; the first, as a “selfmade” method attracting those who felt they were “prepared and ready to do all that dental art and skill could accomplish;” and the second called the “preceptor” method, for those who were nurtured, trained and taught by an existing practitioner in the art and science of dental surgery . The advent and reasoning behind establishing a dental college independent of the existing medical college in Baltimore is contentious and convoluted by historical speculations. Some historians say Dr. Hayden and Harris-only two, but the most prominent, of many of the founders of the college of dental surgery at Baltimore-wished first for a “chair” in the medical school, thus making it a specialty of medicine like otology, rhinology, neurology-i.e. odontology chair. However, other historians speculate that a movement for an independent school from the medical school was based upon the unique needs presented by the art and science of dental surgery-that of dealing with a highly specialize area of the body requiring one skilled in all the sciences of medical practice-physiology, chemistry, anatomy, pathology-and the art of dealing with the hardest structures of the body, the Odenton-complex. Common understanding as we entered the 20th Century was that general infections of the body could generate oral infections and oral infections could do the same for the general condition . We had just witnessed a breakthrough in science showing that there was a relationship between infections and small parasites called bacteria-now we know that virus’ and prions are also involved. An aspect of general infection theory was the focal theory of infection that asserted that “dental foci” could impact the general health of humans. That these small entities known as bacteria could migrate to other parts through the circulatory system of the body and set up foci of that infection in other organs or tissues, was well accepted by most. Dr. Hunter of the London Fever clinic addressed the McGill graduating class in medicine in about 1910 using the term Oral Sepsis and the need to be vigilant about patients’ oral hygiene. He asserted that many chronic infectious illnesses are remedied by simply hygiene of the mouth, good nutrition, or removal of septic teeth and gums, our dental hardware too . Reading the full paper of 1925 and his comments in the first edition in 1940 of his text gives a sense of the historical shift away from Oral Sepsis to the justification of so- called “modern root canal therapy,” a license for leaving gangrenous tissues in the human jawbones . Like the great amalgam-mercury controversy of the early 1800s (Amalgam Wars), Shatz’s Proteolysis-Chelation theory of decay dissolving enamel, not just the lone acid theory (later justifying fluoride in our water supplies as a preventive measure) and the focal theory of infection were fundamentally voted out of the profession in the mid-1940s by the IADR and the ADA. What was not recognized in the last Century was that the chemical effluent being dissolved and released into the general circulatory system by the root canalled dental organ in the jaw, its degradations products (much like those of a dead rat under the bed) are composed of very toxic thioethers, and cadavarene and purtracene the breakdown products of putrefaction-protein decomposition (Figure 1). The new computer tomography imaging discloses a more precise structure of the internal anatomy of teeth conveying the true relationship of the internal anatomy to the periodontal ligament and bone . In the 20th Century the canals depicted in Figure 1 were thought of as straight lines ending at the tips of the roots. This was errant, as we now know. The red areas in Figure 1 show that communications with the ligament about the tooth are more plentiful and robust. What is not shown here is the fact that the dentine is filled with dental lymph intercommunicating with the surrounding periodontal ligament, bone and marrow through lateral canals in the dentine? We offer Figure 2 as a representation of that fact that teeth are porous and sweat outwardly (Figure 2). Figure 1: The root canalled dental organ in the jaw. 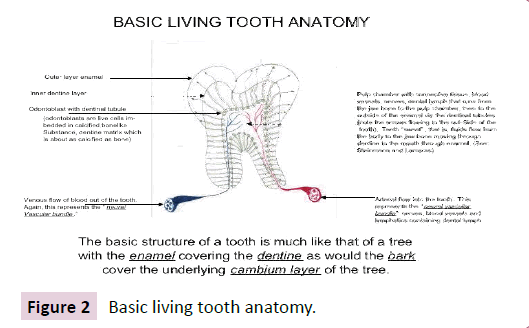 Figure 2: Basic living tooth anatomy. Histopathological evidence showing residual infection/ inflammation at root level of root canal teeth and dental implants. Beyond this fact, adding to the dilemma that now confronts us is that we know for certain many of the disinfectants to clean the pulp chamber, root canals, and their micro-canals used by the endodontic are cytotoxic and mutagenic. The discussions and clarification of these factors never happened in the 20th Century due to the narrow window from which one viewed the issue before the profession, thus leading to the denial for the remainder of the Century of the deleterious impact of leaving dead teeth in the human jaw after root canal therapy (Figure 3). Figure 3:The impact of leaving dead teeth in the human jaw after root canal therapy. The “Tube Theory” of the pulp-root canal anatomy was held as factual until advancements in micros-copy were developed in the mid-1960s. Dental education held to the diagram presented in Figure 2 tube. We see that the main neurovascular bundle exists the tip of the roots. This is not true since accessory canals and lateral canals of the pulp chamber are plentiful. In Figure 3 we see India-ink translucent photographs to the left and the very intricate and convoluted pathways of the dental organs can be. How does one sterilize these canals? Enter the new designer drugs (weapons) developed during WW II and a shift to the designer chemicals that would solve our world problems in the areas of health, diet and nutrition, ending hunger, and on it goes. If a root canal tooth is infected (which all are) the course of action in modern endodontic treatment is analgesics, antibiotics, antipyretics or anti-inflammatory drugs. We still languish in the last century paradigm (LCP), outmoded. In us we knew nothing about acupuncture and energetic health. Today we know a bit more but the (LCP) prevails due mostly to fake news and fake education . The focal theory of dental sepsis has made a strong final appearance and is beginning to be accepted as a Principle in our understanding. It will prevail due to its veracity. Yes, they equivocate but tepidly. I give an example. A current text used in education, Oral Microbiology at a Glance 2010 speaks volumes in acknowledging the role of root canal therapy-Endodontic Infections-and dental implants-Peri-implantitis-in systemic illnesses, as well as that of general periodontal disease. The text verifies the fact that these practices can be readily implicated with the cause of systemic toxic infectious conditions. Big Pharma keeps pumping out new designer chemical and our people get sicker. These products prevent the symptoms but avail no one of a cure-a return to their natural state of health. For the past about thirty-five (35) years the author has accumulated data on odontons (dental organs called teeth), which for one reason or another had to be removed. Most of these dental organs were dead, “cadavered,” having had “root canals.” However, the sample presented here is for the past three decades includes 317 reports (about 358 dead teeth) with root canal fillings (and ~19 people with failed dental implants, total implants ~30). In most every case there was an inflammatory, infected, or degenerate condition (reactive bone lesions), often with actinomycotic organisms, (observed 45%-50% of the time) that was identified by a board-certified pathologist from Queens Hospital Pathology Department (Table 1). Table 1: Histopathological studies 1986-2017 of soft tissue and bone about the roots of endo teeth and metal implants done At Queens Hospital Honolulu, Hawaii. In essence this clinical research study demonstrates that all teeth (and about 30 dental implant patients) show clear signs of rejection (implants too), since the endodontically treated tooth, due to loss of blood supply and subsequent infection-the essential factors in the definition of “gangrene”- becomes a nidus of inflammation systemically, an inflamed foreign object . The healthy dental organ, odonton, has an external and internal nerve, energetic- blueprint, and blood supply as well as intricate lymphatic drainage. Once this is compromised, the internal loss of blood supply renders the shell of the dental organ nothing more than a vessel harboring necrotic debris and micro -vermin. As one may recall, the death of a tissue (in the instant case the dental organ) due to loss of blood supply is termed gangrene (Figure 4). In texts of the early 20th Century the condition expressing as a “dying tooth” was called gangrenous pulpitis. This term gave over to the euphemistic term “devitalized tooth.” Generally, this term is more acceptable to the patient. 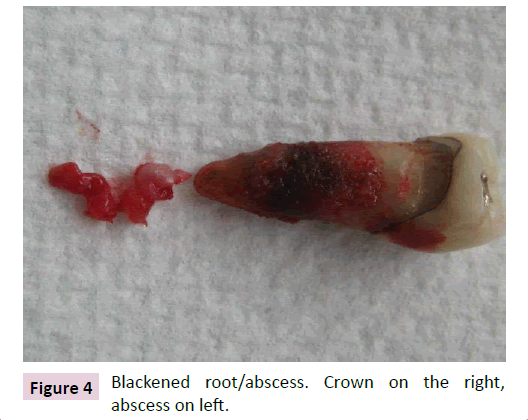 Figure 4: Blackened root/abscess. Crown on the right, abscess on left. No amount of designer chemicals can correct many of the self-caused suffering treatments we absorb ourselves in, their failures. Well then…what shall I do? Suggested is to adopt the principle of cleansing and don’t stop its expression. Cleansing is the Principle of Health for all mankind. Reason for illness is subtle toxification, that is, auto-induced spiritual/mental-emotional/ physical overload. Eat three day old food from your kitchen counter harboring botulinum bacteria and you’ll ether through up, have severe abdominal cramps and diarrhea, or you’ll end your life on the floor . The acts of through up, diarrhea, sweats, fever and chills are natural cleansing phenomenon-not events to be stopped with designer chemical. A spec in the eye elicits watering first, your attempt to wipe out the spec with your finger, the fluttering of the eyelid to cleansing it out by wiping it clean. This is again how we are designed, to cleans-out foreign matter be it chemical as in foods or root canal teeth or dentally implanted screw posts in you jaws. Root Canalled tooth with associated abscess seen in Figure 4 and implant extruding pus in Figures 5 and 6 which shows the corrupt tissue below the metal implant, the dead bone and abscess tissueare similar to a spec in the eye or a sliver imbedded in your finger (Figure 7). All foreign incompatible objects (without viable blood supply) will be pushed out of the human body eventually. This is the Principle of Cleansing, purification. In both cases, the root canal (Figure 4) and the dental titanium implant (Figures 5 and 6), the pathology was the fundamentally the same-marked acute/ chronic inflammation, dead bone, abscess with Actinomyces bacteria. The fact that pathology is found about the root canal and implant demonstrate the principle of cleansing; that is, the body’s attempt to wall off the infected matter, dissolve it by inflammation related to the presence on Actinomyces or other bacteria, whose essential role is the dynamic and active soft and hard tissue degradation, dissolution and deletion from the human body. Fundamentally, the role of bacteria is clean-up of the infected tissues before immunological cells appear to assist. They (bacteria) are not causative of infection but opportunistic; and, they are critical in healthy resolution of periapical and periodontal infections. Essential is to understand that the pathology is the result of the bio-incompatible dead tooth and dead metal screw post that are left in the human jaw . Figure 5: White bubble at gum line is pus from implant located to the right of the gold crown. Figure 6: Metal titanium screw implant with dead bone and abscess below. The bacteria Actinomyces are ubiquitous and abundant in soil and the human oral cavity. They are known for the important role they play in soil ecology and therefore play a role in human ecology; they produce a number of enzymes that help degrade plant root debris and waste materials in soils, doing the same in corrupted oral tissues. Thus their presence is important in the formation of compost and does the same in the jaws of humans. They are also known for causing diseases in humans and livestock, usually when they get an opportunity to gain access to the body's interior through wounds-a dental implant is “an open wound.” As with other opportunistic infections, people with immunologic issues are at higher risk. In all of their specific traits and in their branching filament formation, they bear similarities to Norcardia causing Norcardosis a similar illness as Actinomycosis. The premolar above (Figure 4) and abscess tissue to the left demonstrates a natural proclivity of tissues without life, without blood supply and oxygen turn black and blue. As a corpse will do in a short time after death, it turns black. Same is true with the sliver (Figure 7). The soft tissue around the sliver projecting to the right was abscessed. Once removed as with a root canal tooth or implant healing is rapid and uneventful, painless too. And on another topic, if you have pain, don’t go for the Percocet or Oxycontin. Pain, although very unpleasant at times, is the movement of toxins/poisons through tissues seeking eliminationgratitude, please. 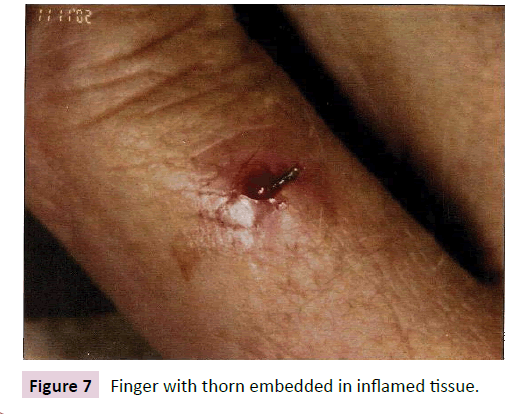 Figure 7: Finger with thorn embedded in inflamed tissue. Acupuncture is a best way to balance the pressures in life, what we call “pain.” Do that, or massage, or tai chi, or gentle acupressure message…and offer the elixir to happiness by expressing your- Gratitude. Dental and medical practitioners should best review the advisability of root canal or dental implant procedures since the oral systemic connections to sites of chronic inflammation has been well demonstrated. Our research corroborates these findings. Lizi EC (1992) A case for a dental surgeon at regional radiotherapy centres. Brit Dental J 173: 24-26. Clavien PA, Sanabria JR, Strasberg SM (1992) Proposed classification of complications of surgery with examples of utility in cholecystectomy. Surgery 111: 518-526. Desvarieux M, Demmer RT, Rundek T, Boden-Albala B, Jacobs DR, et al. (2005) Periodontal microbiota and carotid intima-media thickness: The Oral Infections and Vascular Disease Epidemiology Study (INVEST). Circulation 111: 576-582. Szmukler-Moncler S, Salama H, Reingewirtz Y, Dubruille JH (1998) Timing of loading and effect of micromotion on bone-dental implant interface: review of experimental literature. J Biomed Mat Res 43: 192-203. Jaffe HL (1953) Giant-cell reparative granuloma, traumatic bone cyst, and fibrous (fibro-osseous) dysplasia of the jawbones. Oral Surgery, Oral Medicine, Oral Pathology 6: 159-175. Silness J, Löe H (1964) Periodontal disease in pregnancy II. Correlation between oral hygiene and periodontal condition. Acta Odontologica Scandinavica 22: 121-135. World Health Organization (2004) International statistical classification of diseases and related health problems. World Health Organization. Ray HA, Trope M (2002) Periapical status of endodontically treated teeth in relation to the technical quality of the root filling and the coronal restoration. Int Endodontic J 28: 8-12. Nelson A (2002) Unequal treatment: confronting racial and ethnic disparities in health care. J National Medical Association 94: 666. Van Eijden TM, Korfage JA, Brugman P (1997) Architecture of the human jawÃ¢ÂÂclosing and jawÃ¢ÂÂopening muscles. The anatomical record 248: 464-474.